The Double Panel Climber adds a new dimension to the single panel climber. 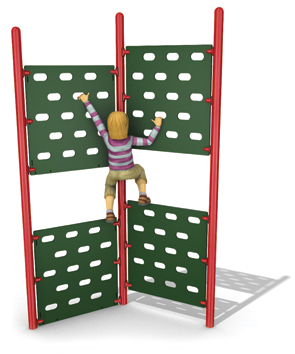 By adding a second climbing column children can race each other, climb together, climb across both panels, and much more. Utilizing the hand and foot placement cutouts, children can practice their climbing skills while improving their hand-eye-foot coordination, balance, and strength. The 3/4" solid commercial grade plastic climbing panels are supported with either a 3-1/2" or 5" steel posts. The steel posts are made from 3.5" O.D. 13 gauge galvanized steel that is powder-coated with a triple flo-coated corrosion protection for a superior, high gloss, no peel, no flake finish. 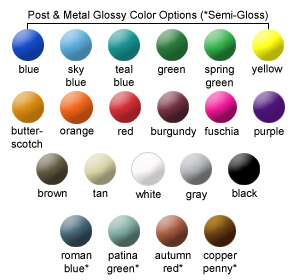 Panel and post color options shown below.